The farm that I purchased was originally used to milk 300 holstein-sized cows, with another 150 cows on the property that weren't being milked. So my barns at time of purchase were set up to house 450 cows inside a barn for the whole year. The cows typically wouldn't ever exit a building. My pig operation wants to provide shelter and labor-saving for the winter months when things aren't growing, but the majority of the time I want the pigs to be outside doing their pig thing. I have 4 main barns; a 30'x100' birthing shed, a 100'x80' wooden hay barn, a 44'x110' heifer barn, and a 250'x100' main barn. The big construction project for this spring is putting in a new floor in the 44x110' heifer barn. for as large a barn as it is, it's pretty much unusable in its current form. the edge. 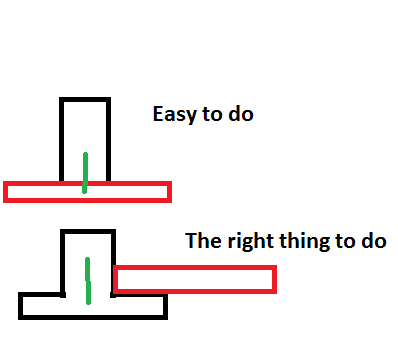 The "easy to do" picture is how they formed up that wall. The red is the slab, and the black is the wall. The water flows in the crevice between the wall and the floor, and while the flow is slowed by the wall, that just means that it continues to dribble out for days after it rains. Had they poured the wall as shown in "the right thing to do" the water would have been mostly prevented from entering the barn in the first place; or if it had it would have been easy to fix. and much stronger. The way these knee walls are formed leaves them liable to be knocked free by normal activity - i've broken them free myself. As it is, to dry out the floor of this barn, I'd either have to put in a drain along the full 110' length (and then figure out somewhere for the drain to empty to!) or I'd have to do something to try to seal the concrete, or both. The walls that they formed are curbs for pushing manure around, and I really don't need that in my operation. Maybe a perimeter wall so that i can scrape the barn with a tractor without damaging the walls. So what I'm going to do is to remove the walls and curbs, and then put a few inches of gravel down, compact that, and then lay a plastic sheet over the whole floor. Both for vapor barrier and to keep the concrete from getting into the gravel. The basic plan isn't to try to restrict the flow of the water, it's to give it a place to flow that doesn't affect the use of the barn - basically raise the floor about 8" from where it is now. As a side benefit I'll also increase the grade (the slope of the floor) so that water drains from the barn more easily when I pressure wash it or clean it. And finally I'm going to do a trowel-finish, so that there's less texture for the bedding or material to stick to. 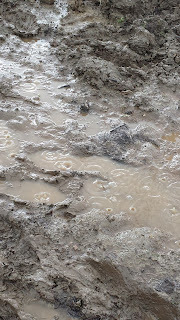 It's a little less firm for footing, but every crack and crevice is someplace that is hard, or impossible, to clean, and being able to completely clean animal areas is important for biosecurity reasons. I've got two contractors coming on saturday to give me estimates, and one on monday. Curious what they'll quote me for this slab. it's 5500 or so square feet, 2% slope, trowel finish. about 60 yards of concrete. If you're looking to grow fruit trees in western washington, I found this reference very handy. WSU has done more than a decade of research on what grows well in our area, and gives you all of the information that you need to pick the trees that have the best shot at doing well for you. What I'm doing here is for personal use mostly - it's a lot of trees, but I'll keep them small - 7 to 8' tall so that they can be handled from the ground and the fruit easily picked, and I'll fence around the orchard to keep out the walking critters - cows love the new leaves on fruit trees, and they like scratching on the posts, so it's a disaster if they get into the orchard. The overall idea is to have some fruit available the whole summer and into the fall; a few trees ripening every week, and every two weeks or so a new blueberry variety ripening. This is opposite the goal of a commercial planting where you'd like everything to get ripe about the same time. The plantings are also being done down the road to shield the house from the road a little, so I'm planning on these trees becoming a hedge of sorts when they're mature. So I've staggered the two rows of trees so that the second row is centered between the first row to provide the most visual blockage. 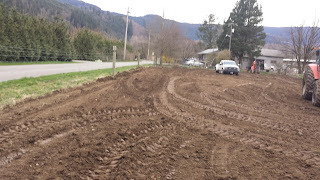 I laid out the new orchard over the last few days; plowed and leveled and then did some fertilizing with manure and compost. It looks great in this photo, but this was before the rain. Baling twine is my go-to tool for this sort of work. I'd like the plant spacing to be accurate, and I'd like straight lines as much as possible so I can move equipment up and down the rows if I need to without hitting the plants, and baling twine is a cheap way to do that. 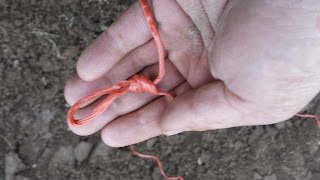 For plant spacing I'll just tie a loop at every space that I want a plant at, and then re-use the same length of twine for each row. Makes it a little easier to do a neat and professional job. 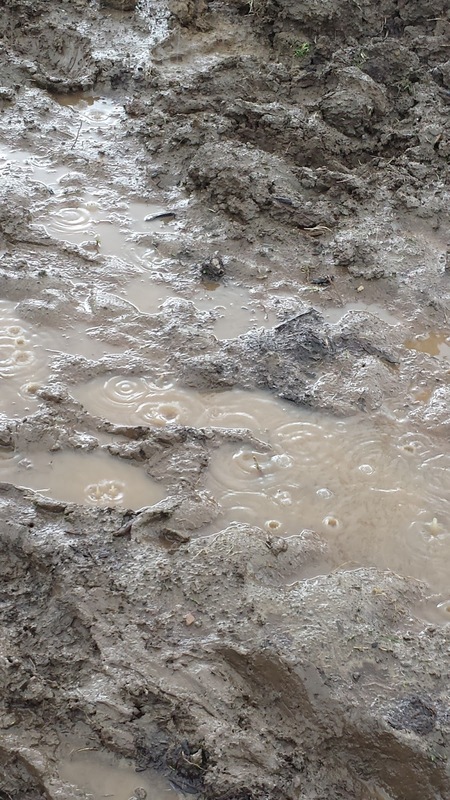 You can see the raindrops hitting the puddles. The wet conditions actually were nice for the plants. The majority of the plantings I'm doing right now are bare-root, and having them be wet the whole time is good to keep them in condition. 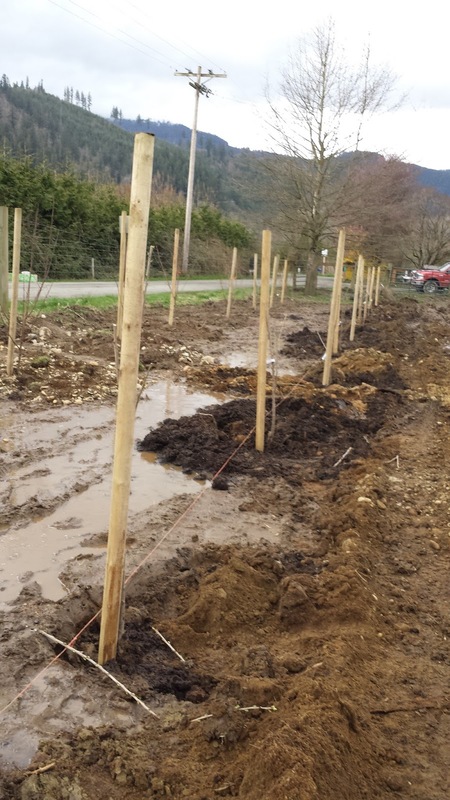 I've found that with bare-root plantings it's best to get them into the ground as quickly as possible, so I laid out the orchard and prepped the ground before I purchased the plants. For the trees I dug a hole 3' square, and then did 50/50 compost and soil into the hole, added some fertilizer (10-10-10) and then mulched on top with wood chips, sawdust and/or straw (depending on where I was scraping the barns) to a depth of 2-3". 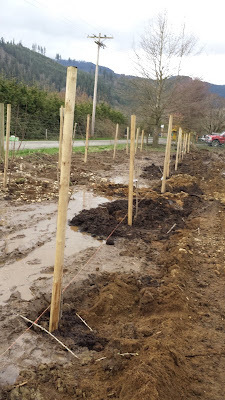 Each tree is staked, and the trunk is tied to the 2" post, and then the trees were all pruned for shape and size. For the bluberries I dug a trench for each variety, mixed in sawdust and compost, and then planted the blueberries. I'll mulch them as I did with the trees. Mulching is a lot less labor than weeding later. Apple tree winter prune - go over the trees before they start waking up, thin them and shape them. lay the orchard organization out, and then plant the trees. I'm planting nectarines, apricots and cherries. winter loss and add another 2 hives to my bees for the 2017 year. eat fresh carrots and beets, so a decent quantity of both of them. Carrot seed in pelleted form because the seeds are sooo tiny! when they arrive in a few days I'll get the tomatoes started immediately. Final grape pruning, and grape arbor fertilization and cultivation. placement of compost/manure between the rows and then rototilling it into the ground to kill the weeds and mix the compost and manure into the ground, and then a cover crop between them. I'll be running chicken tractors down the rows, so I'll plant something that chickens like to eat. Fencing inspection, repair and construction: I'll be walking the entire perimeter fence to make sure that it's in good, servicable shape after the winter storms and floods, repairing what needs it and then making some changes for utility. I'm going to start to rotate the cows through various areas of the farm, so I'll need some cross fencing and an aisle to make that easier, so that's on the list. As far as animals go I'll be selling last years calves for feeders in a month or so - I wait until people have grass to feed the steers, the price gets better. I will retain one of them for personal beef, and the rest go to market. I'll also be culling 20 to 30 sows based on their performance as mothers, leaving me with around 100 productive older sows, and I'll select 20 piglets as replacement sows. Our piglet production this year needs to be around 2000, and I may make it with the sows I have on hand. we've hand some challenges with weaning numbers in the winter, but it usually improves as the weather improves. This has been a cold, wet, windy winter. Looking forward to some warmth and sun myself. The project money is offered basically with no, or not many, strings. That is, if your project is late or has a delay, or just doesn't get done at all, there's very little recourse your backers have. So from the perspective of the person receiving the money, it's a great deal. 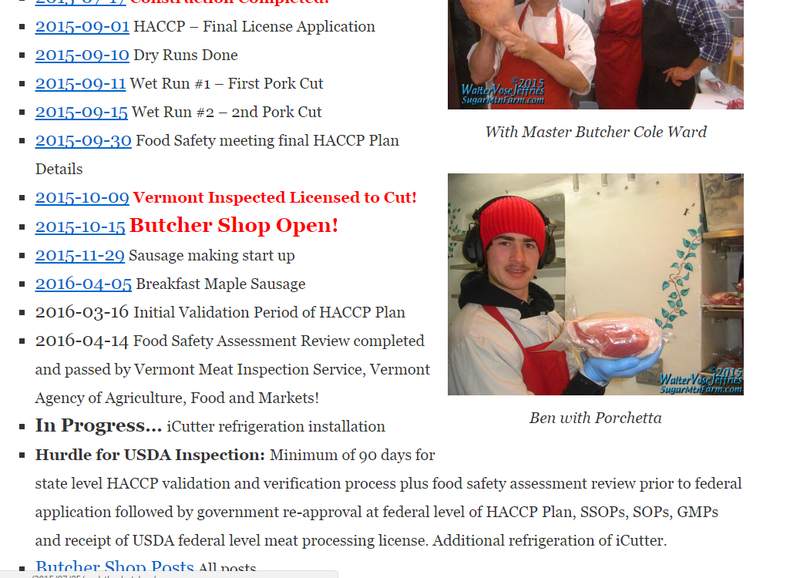 A case in point is the butcher shop at Sugar Mountain. The idea was to build and operate a meat processing facility on the farm where the pigs were - and by doing so capture some of the money that would normally be spent transporting the pigs to slaughter and then picking up the processed pigs at a later date, and the fees that would be charged for that. allow better and easier scheduling. You could process when you had orders. No downside. Walter Jefferies also had the goal of "...open sourced demonstration of how a family can bootstrap their own USDA/State inspected meat processing facility. " The risk with kickstarter projects is that the average internet user isn't used to evaluating risks and challenges of a small business, and isn't usually given any tools to do so. when you go to a bank and ask for money they may ask for a business plan, tax returns, revenue forecasts - past and future - and other documentation that shows that you've done your homework and that at least on paper the venture pencils out. In this case one of the first things that Walter did was buy a scalder/dehairer for $40,000, which he duly noted as having arrived, but what's funny about that is that there's no mention of that machine for the next 5 years. No pictures of it installed, no pictures of it in use. Near as I can tell the machine has been sitting there, in its factory packaging, for the last 5 years. do a good job, and with the volume of 20 pigs a month that walter claims he's doing, that would cost roughly $400 (figuring labor at $20/hour for 20 hours) per month. Which means, on a labor saving basis, that machine will pay itself off in... well, never. But I understand wanting new stuff myself. I've asked Walter on the kickstarter page if he ever plans to complete the USDA portion of this project; and two weeks after asking no reply. Walters kickstarter backers have been complaining about the schedule for the last few years, but as mentioned previously, there's not much recourse. He'll either complete it (or not) and if you get anything he promised you, well, that's a bonus.